Ahhh Freshers’ Week. 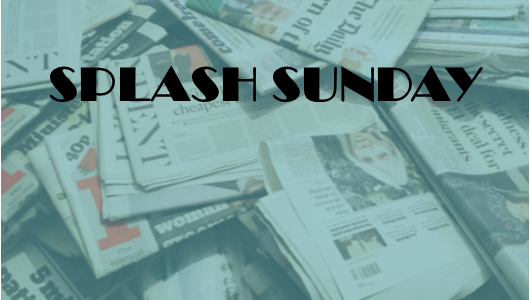 Its easy to look back with rose-tinted, snakebite-fogged spectacles now, at the wise old age of twenty-one, and remember it as the crazy, exciting, hilarious time we’d all like it to have been. In reality, I spent far more time choosing outfits, changing outfits, and straightening my hair, while working up the courage to go knock on my flatmates’ doors, than I’d like to admit. I got lost on my way home from nights out, hungover-cried in my weird plastic shower pod, and once climbed home through my kitchen window, for no apparent reason. Looking back, I wasn’t exactly giving off the glamorous, grown-up impression I was so desperate to. What I’m trying to say is, its a bizarre, disorienting, and often overwhelming time. You’ve just moved halfway across the country to live in a flat with a bunch of strangers and everyone keeps telling you you’re supposed to be having the time of your life. Take some time to unpack, have the odd night in with Netflix, and ignore the FOMO for five minutes while you figure out that incomprehensible map of campus. And aside from getting those all-important Freshers’ Guides off to the printers on time, I really hope you all enjoyed yourselves, in whatever way you chose to. Whether you were consistently drunk for the entirety of freshers’ fortnight (in which case, I take my hat off to you in utter admiration), get struck down by freshers’ flu two days in, or simply choose to spend it making mates and memories in an altogether more moderate way: it isn’t a competition, and it really doesn’t matter. Now, where did I put my body glitter..? From all the brilliant examples, it was hard to pick my favourite Freshers’ Guide. 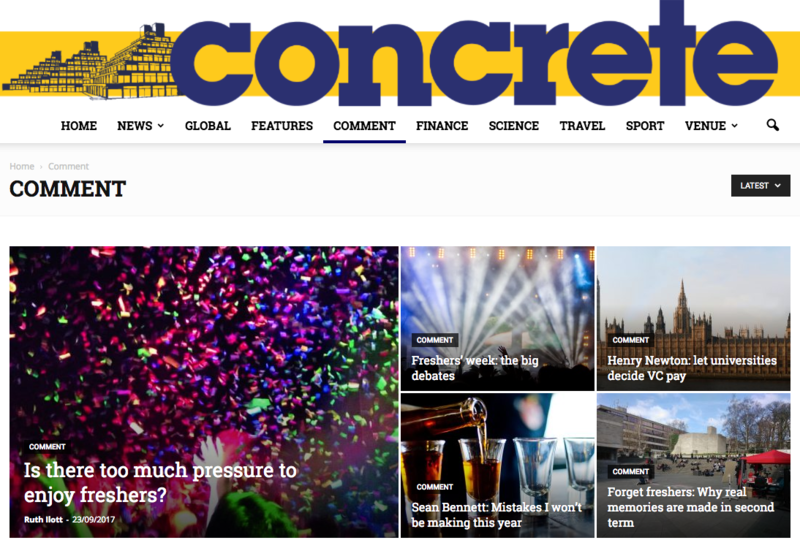 However, shout out to Concrete for their brilliant issue. Stand out sections included features and comment, which had some really great, fun articles that delved into some crucial debates… such as which VK is the best flavour!? A special mention to the Venue team too for their gorgeous redesign. I can’t believe it was made by students! 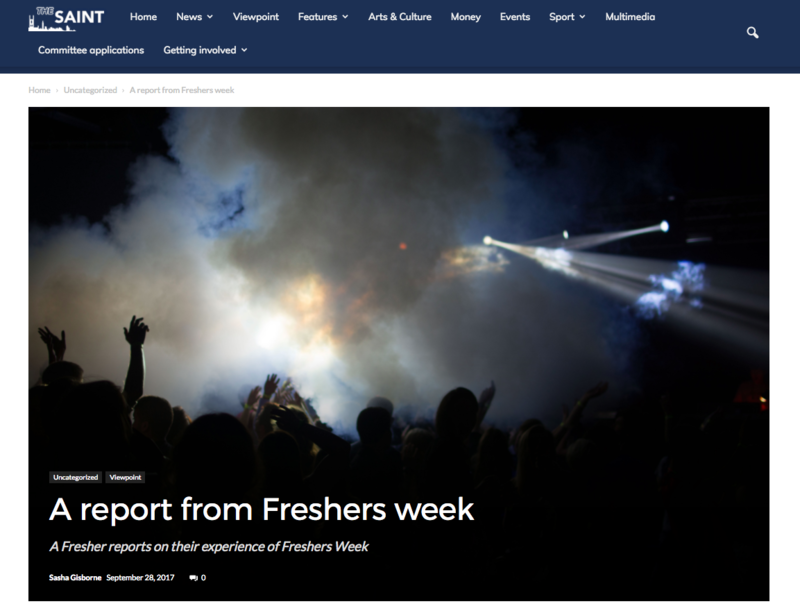 For those of us of a certain age, Freshers week is a long, long time ago, but Sasha Gisborne’s satirical report on Freshers Week rings pretty true. The Edge have come up with a great Freshers guide for those joining the University of Southampton while also remaining true to their brand. 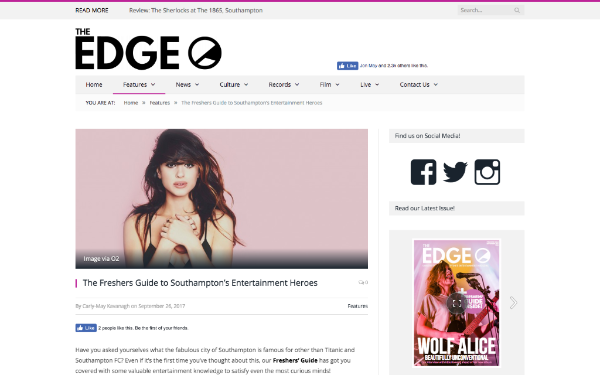 As a magazine that focuses on culture Carly-May Kavanagh has done a neat little round-up informing new students of famous faces they may not know are linked to the Solent area. 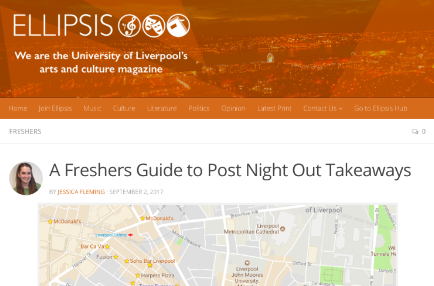 Ellipsis have created a fantastic ‘Freshers page’ for those starting at Liverpool, full of advice to first years, and top tips for settling in. They’ve even created downloadable wall charts! But I have to say my highlight (surprise, surprise) is their round up of post night out takeaways… Great work guys. 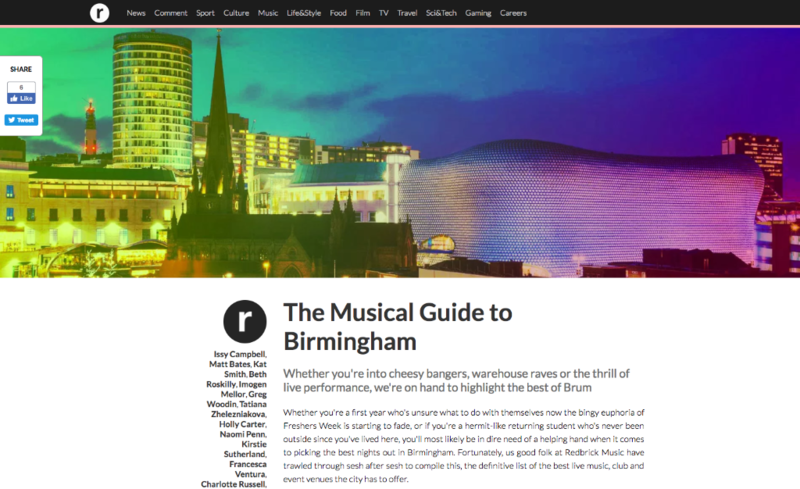 I also really enjoyed this guide to the music scene and nightlife of Birmingham – including the stunning image they’ve illustrated it with, and the slick layout of the webpage. 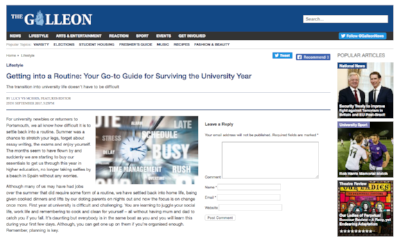 This informative Freshers guide from The Galleon covers all the important basics for surviving at university, including some particularly sensible financial advice.